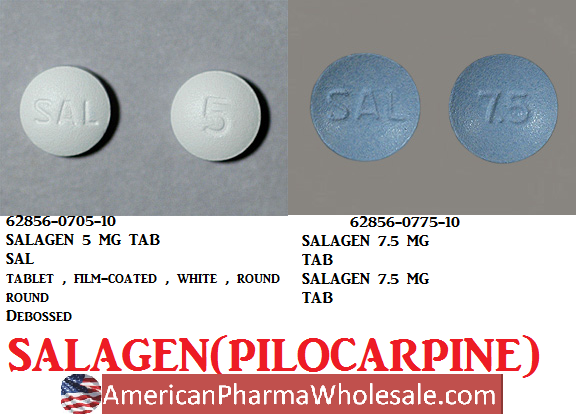 SALAGEN® Tablets contain pilocarpine hydrochloride, a cholinergic agonist for oral use. Pilocarpine hydrochloride is a hygroscopic, odorless, bitter tasting white crystal or powder which is soluble in water and alcohol and virtually insoluble in most non-polar solvents. Pilocarpine hydrochloride, with a chemical name of (3S -cis)-2(3H)-Furanone, 3-ethyl-dihydro-4-[(1-methyl-1H -imidazol-5-yl)methyl] mono-hydrochloride, has a molecular weight of 244.72. Each 5 mg SALAGEN® Tablet for oral administration contains 5 mg of pilocarpine hydrochloride. Inactive ingredients in the tablet, the tablet�s film coating, and polishing are: carnauba wax, hypromellose, microcrystalline cellulose, stearic acid, titanium dioxide and other ingredients. Each 7.5 mg SALAGEN® Tablet for oral administration contains 7.5 mg of pilocarpine hydrochloride. Inactive ingredients in the tablet, the tablet�s film coating, and polishing are: carnauba wax, hypromellose, microcrystalline cellulose, stearic acid, titanium dioxide, FD&C blue#2 aluminum lake, and other ingredients. Pharmacodynamics: Pilocarpine is a cholinergic parasympathomimetic agent exerting a broad spectrum of pharmacologic effects with predominant muscarinic action. Pilocarpine, in appropriate dosage, can increase secretion by the exocrine glands. The sweat, salivary, lacrimal, gastric, pancreatic, and intestinal glands and the mucous cells of the respiratory tract may be stimulated. When applied topically to the eye as a single dose it causes miosis, spasm of accommodation, and may cause a transitory rise in intraocular pressure followed by a more persistent fall. Dose-related smooth muscle stimulation of the intestinal tract may cause increased tone, increased motility, spasm, and tenesmus. Bronchial smooth muscle tone may increase. The tone and motility of urinary tract, gallbladder, and biliary duct smooth muscle may be enhanced. Pilocarpine may have paradoxical effects on the cardiovascular system. The expected effect of a muscarinic agonist is vasodepression, but administration of pilocarpine may produce hypertension after a brief episode of hypotension. Bradycardia and tachycardia have both been reported with use of pilocarpine.